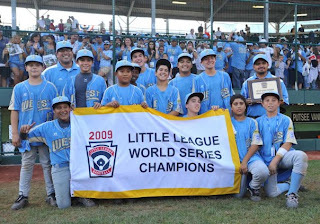 Upper Deck is going to treat the kids from California's Chula Vista Park View, Champions of the 2009 Little League World Series, to their own baseball cards. A very cool and nice gesture. UD losing their MLB license makes me nervous that this is a gimmick in the making. So if any of these little guys ever get signed to a multi-million dollar contract in the bigs, will this be their "true" rookie card? lol, something about desperate times calling for desperate measures or some such. I hope they don't insert these in products. I think it's bad enough that the "leader" is capitalizing enough on the backs and tears of 12 year olds.